Snowmobiling in the deep wilderness of Karelia is a true adventure! During this 3-day tour you will experience various Karelian landscapes from the frozen Karelian lakes and snowy forests to the sand dunes sleeping under the snow blanket. 09:00 Meeting with the guide at the railway station in Petrozavodsk. Breakfast. Transfer (20 km) to the snowmobile safari starting point. Upon arrival we take you through snowmobile safety instructions, do a riding briefing and equip you with boots, a special snowmobile suit and a helmet. Now it is time for your snowmobile adventure to begin! Today we cover the distance of 100 km and plunge into the idyllic winter landscapes and the thrill of speed. 11:30 Excursion in the Karelian zoo complex, where you will get acquainted with local animals. Lunch. Upon arrival at the guesthouse accommodation. Hot sauna and substantial dinner will make a final touch for your perfect winter day. Breakfast. Afterwards we start our way through a number of cozy Karelian villages to Kinerma village, which in 2016 got the status of the most beautiful village in Russia. Upon arrival excursion in the village. You will get acquainted with Karelian traditions and the history of Kinerma Village. Nadezhda, local resident of Kinerma, and her family will answer all your questions and treat you with traditional Karelian lunch in their house. Afterwards we continue our snowmobile safari in the charming winter landscape to our guesthouse. Total distance for today is 160 km. In the evening substantial dinner and sauna will help you relax after an exciting day. Breakfast. Today we cover 100 km by snowmobile and go through picturesque Karelian wood landscapes and villages to the shore of the largest lake in Europe, Lake Lagoda. Because of its size of 17600 km2, local people people used to call the Ladoga the Russian Sea. 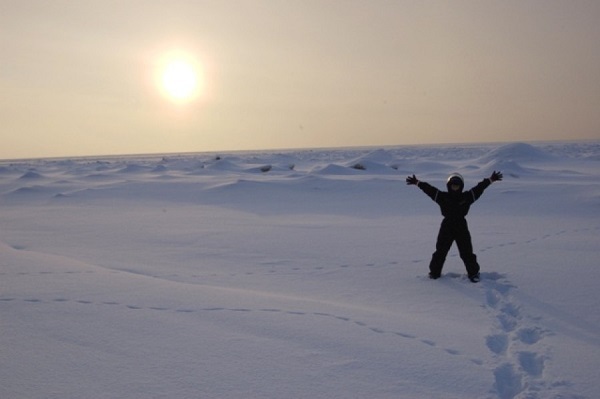 Today we will enjoy the panorama of this beautiful lake and excitement that you will get from riding a snowmobile across the sand dunes covered with snow. 18:00 Return to the guesthouse. Farewell dinner. 21:00 Departure to the Lodeynoye Pole railway station. Snowmobile «BRP Lynx Adventure LX 550». Warm windproof overalls, snowmobile helmet, balaclava, snowmobile shoes and gloves.